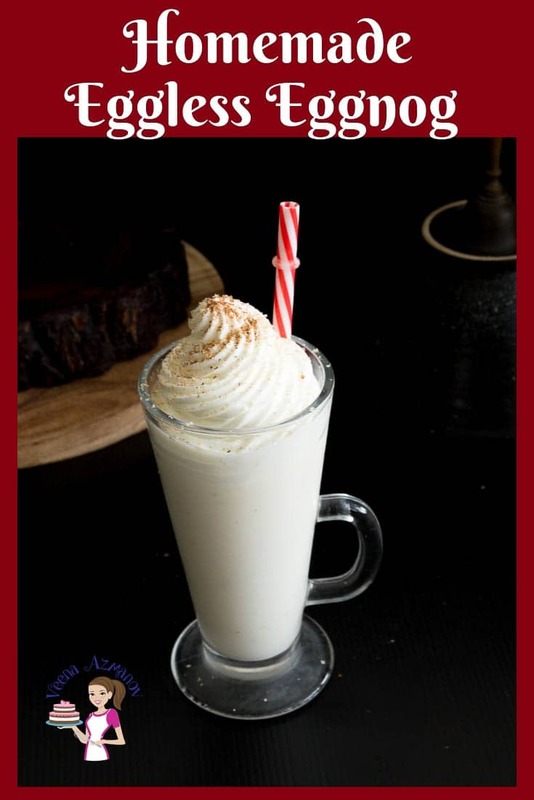 Traditional eggnog is made with egg yolks and whipped egg whites. 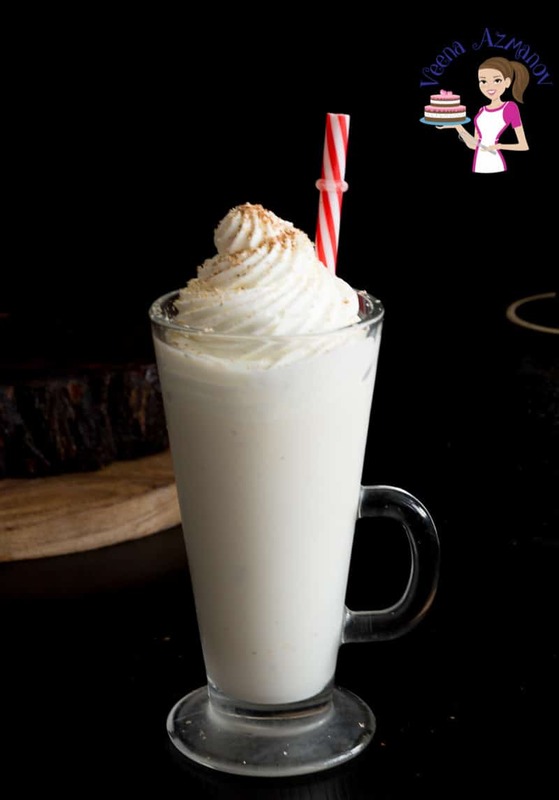 This eggless eggnog is made without any eggs, but, there is no compromising the flavors. It’s still that rich thick and luscious drink flavored with nutmeg and cinnamon. Perfect to celebrate the holidays with family and friends. I’ve also given you variations on how to make more eggnog flavors. My son called me ‘the crazy eggnog lady’. Recently, my son asked me to make eggnog for his friends because they had never heard of eggnog and he wanted to taste it. I agree to make some for them and asked him what flavor would he like? He took his friend to the blog and showed them the recipes I have on here. First, he was surprised that I had so many eggnog recipes – not much just six. And then he was fascinated that these were his drinks that get photographed just before he enjoys them. He comes home and says – mom, you have to stop posting so many eggnog recipes or people will start calling you the ‘crazy eggnog lady’. Is six really a lot? I don’t think so. Well, they may be six but I love each and every one of them. 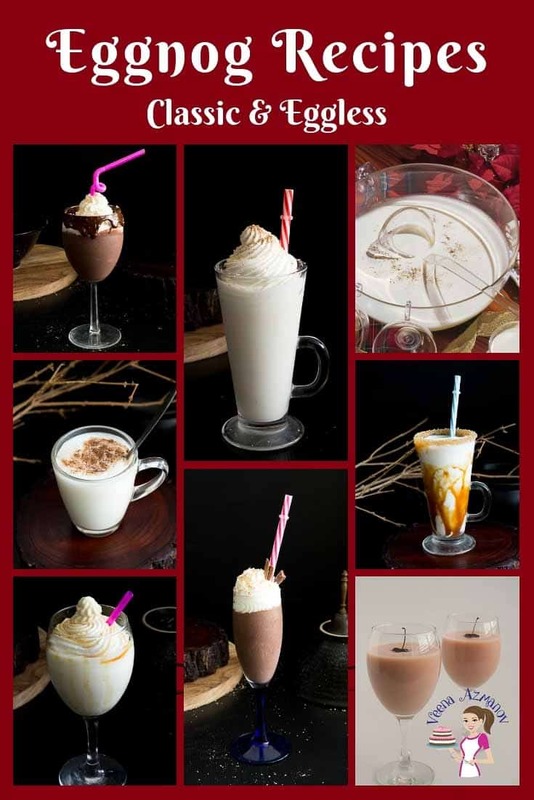 From my fool-proof classic eggnog recipe to the maple sugar-free eggnog as well as the Cherry eggnog or caramel eggnog, The hot cocoa eggnog is Rhea’s favorite and the rich chocolate eggnog Aadi’s favorite. 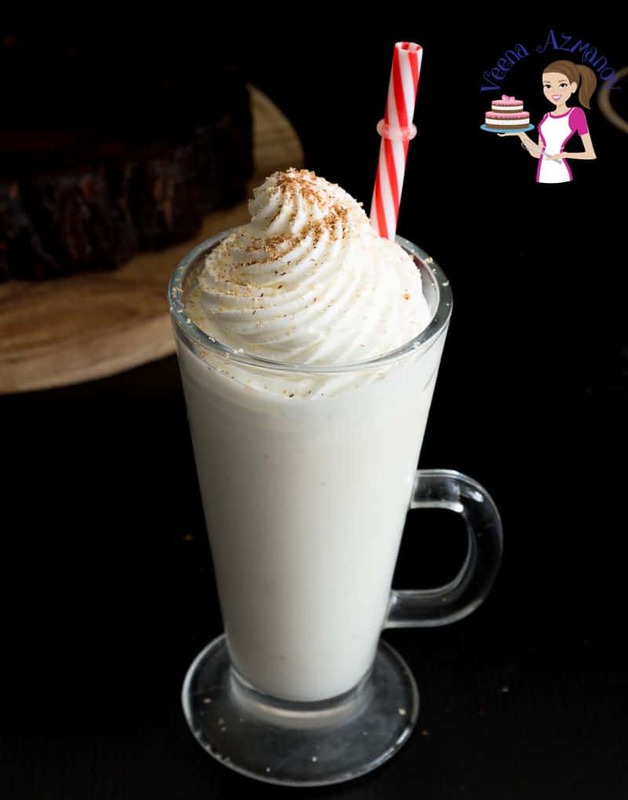 This is my eggless version of the eggnog made very similar to the eggless vanilla pastry cream. Why should you not be able to have eggnog during the holidays just because you don’t have eggs? Right? So now, my eggless friends can still have eggnog on Christmas Eve, with or without alcohol. As you can see below the process is very simple and easy. 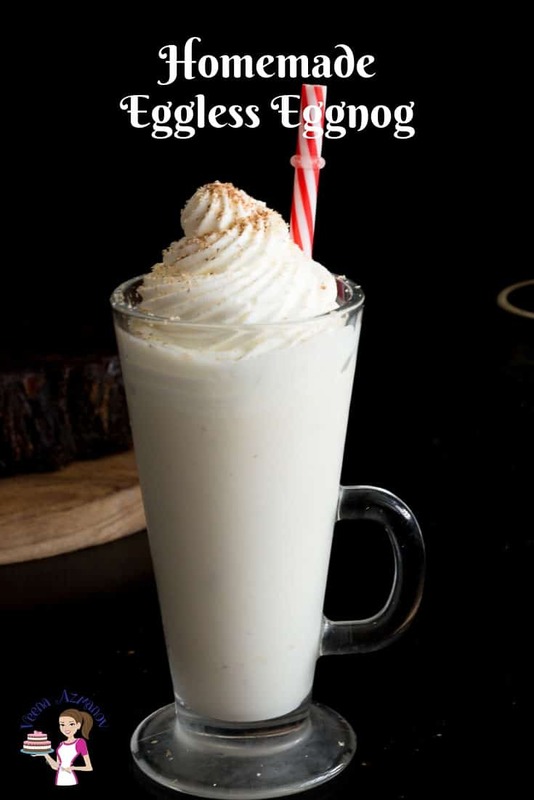 It looks just like classic eggnog and is just as rich and glorious as any other eggnog. I have given you a few variations as well. Such as adding a little hot cocoa will give you eggless hot cocoa eggnog. Adding a little dark chocolate will give you eggless rich chocolate eggnog, and substituting the sugar will maple or honey will give you eggless sugar-free eggnog. Aint’ that a treat. Whole milk – I use 3% milk – that’s what I get as whole milk. You can also use Almond milk to make this a vegan or non-dairy eggnog. Cornstarch or cornflour – Cornflour and cornstarch are the same and looks like flour. Cornmeal, however, is not the same and looks like semolina. So, make sure you check and use cornstarch/cornflour. You can also use 3 oz of French vanilla instant pudding instead as well which is made of cornstarch. Sometime pudding mixes may contain arrowroot or tapioca and that’s ok. These are all thickness agents and will work just as well. If you choose to substitute take not they all may vary in thickness so watch for consistency when cooking you do want to make this thick and creamy but still something that can be drunk from a glass. Alcohol – This is optional and yes you can skip it. I use a good quality rum and brandy. I love using cherry brandy too. 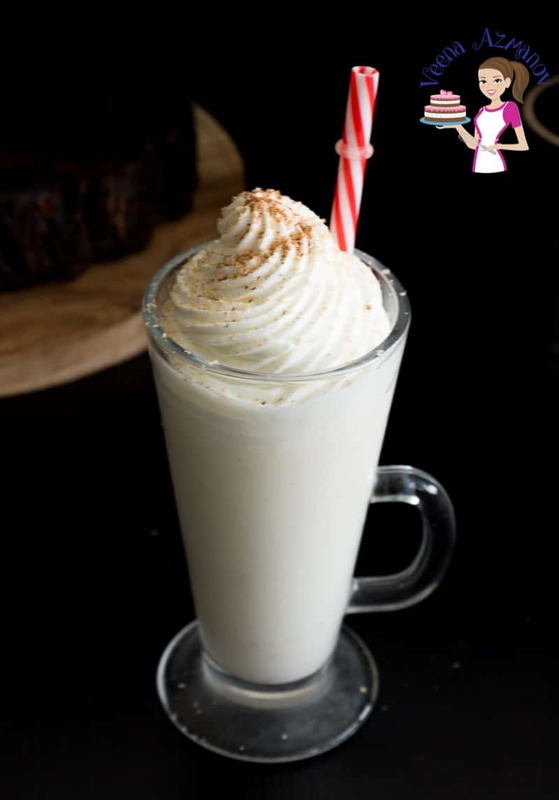 If you find that the eggnog mixture is too thick, replace the alcohol with apple juice. When cooking with pudding, cornstarch or flour a Whisk is the best to use when stirring. This prevents lumps and keeps the mixture smooth at all times. Combine the cornstarch, sugar, cinnamon stick, nutmeg and milk in a saucepan. Cook stirring constantly so it does not stick or burn on the bottom and sides. It is important to cook on low so the cornstarch cooks and thickens. You want it thick enough to coat the back of your spoon. Remove from heat add the cold fresh cream. Pour the mixture into a jug and let chill in the fridge for at least 2 hours. Sprinkle with freshly grated nutmeg and cinnamon powder. Then pour into a jug before serving. Proceed with the recipe as above. Add a little milk to the cornstarch and stir well. Combine the sugar, vanilla cinnamon stick, nutmeg and milk and cream in a saucepan. 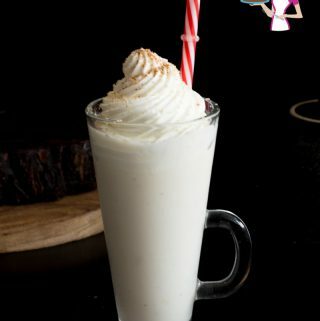 This looks like eggnog perfection! I can’t wait to try it! Absolutely!! especially for the cold climate. I think it’s great that you are embracing the title of “eggnog lady”. This is the first time I have seen eggless eggnog, I was always afraid to make my own because of the eggs. Will have to try this recipe. Oh, this is so easy Luci. You must try.